Sometimes life gets busy. You’ve got dinner cooking, the phone is ringing, and the kids are screaming. 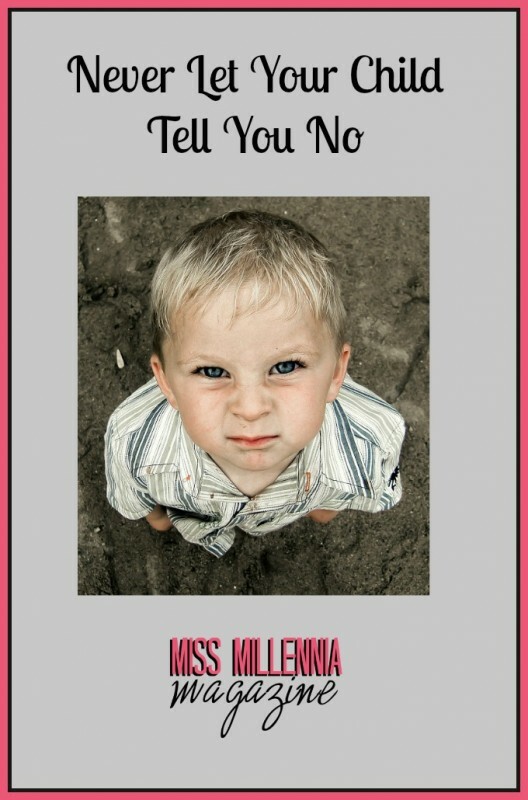 You ask your firstborn to pick up their mess, and from their mouth comes the dreaded word “no.” With all the chaos mounting around you, it would be easy to blow off your child’s attitude and worry about the clean-up later. My tip to you: don’t wait. Ignoring the situation at hand is only going to perpetuate and amplify future incidences. Allowing your children the right to say no shifts the parent-child roles. Parents are supposed to set boundaries and teach children right from wrong. If the child thinks they have the power of “no,” they may choose to ignore the valuable lessons you attempt to teach them, since they can successfully disagree. A child conditioned this way will be an even bigger handful as a teenager. Unless you’re super excited about arguing with your child for the remainder of their upbringing, deal with the “no” problem immediately. If you don’t, it will continue to grow as your child does. You don’t want your eight-year-old refusing to do homework, or your 16-year-old ignoring her curfew. It’s especially important not to let your oldest child say no, as that will teach their younger siblings to do the same. Can you imagine all of your children disobeying you, one by one? Your house would become absolute kid anarchy! So instead of letting “no” go, talk with your children; explain the importance of your role as their parent. Even if they do not quite understand, let them know it is their job to listen to you, and your job to guide them. If “no” has become a recurring problem for you, try remedying the situation. Praise your child when she is compliant. Let her know how much you appreciate her cooperation. Also, think about how you address your children when asking them to do something. If you find yourself yelling or speaking harshly, consider a nicer way to go about it. Kindness can go a long way with kids, and help save you from future headaches! – Terrific Parenting, a website created by Dr. Randy Cale, explains ways to avoid the “no” power struggle. – Children Who Say No When You Want Them to Say Yes is a book written by James Windell M.A. It explores strategies for dealing with oppositional children.